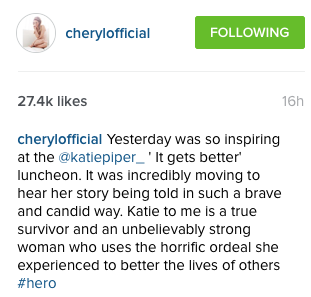 Cheryl Fernandez-Versini posted an inspiring message for Katie Piper on Instagram - and it's so sweet! The X Factor judge, Cheryl Fernandez-Versini has dedicated an extremely sweet post on social media to former model, Katie Piper. Cheryl, 32, took to Instagram to honour Katie, 31, who was brutally attacked when she had sulphuric acid thrown in her face. Cheryl branded Katie a ‘true survivor’ a ‘hero’ and ‘an unbelievably strong woman’ when she attended the ‘It Gets Better’ luncheon alongside her X Factor co-stars, Caroline Flack and Rochelle Humes. The singer said: ‘It was incredibly moving to hear her story being told in such a brave way. Katie to me is a true survior and an unbelievably strong woman who uses her horrific ordeal she experienced to better the lives of others #hero’ We couldn’t agree more, Cheryl! Katie was a successful model and an aspiring TV presenter when she was splashed in the face with sulpuhric acid by a stranger on the streets of London in 2008. The man was instructed to carry out the attack by David Lynch; someone who she had briefly dated. He had previously beaten Katie, threatened to kill her and stabbed her several times in the arms. He is now serving a life sentence in prison. Following her tragic injuries, Katie has since had three of her own TV series called ‘Katie: My Beautiful Face’, ’20/20′ and ‘Katie: My Beautiful Friends’. She was also the presenter of Channel 4’s ‘Bodyshockers’ – a show about the consequences and results of cosmetic surgeries. As a result of her own suffering, Katie dedicated her career to helping others and raising awareness for victims of similar incidents. She has her own charity ‘The Katie Piper Foundation’ which helps victims of burns and other disfigurement injuries. She got engaged in December 2014 to partner Richard James Sutton and the couple had their first baby, Belle, in March this year.